Canon 6d modified and TS71 scope@f5. Taken by Lynn Hilborn, WhistleStop Obs,Grafton,Ontario on September 4 and 5, 2015. ISO 1600 17 x 10 minutes. The Veil Nebula is a cloud of heated and ionized gas and dust in the constellation Cygnus. 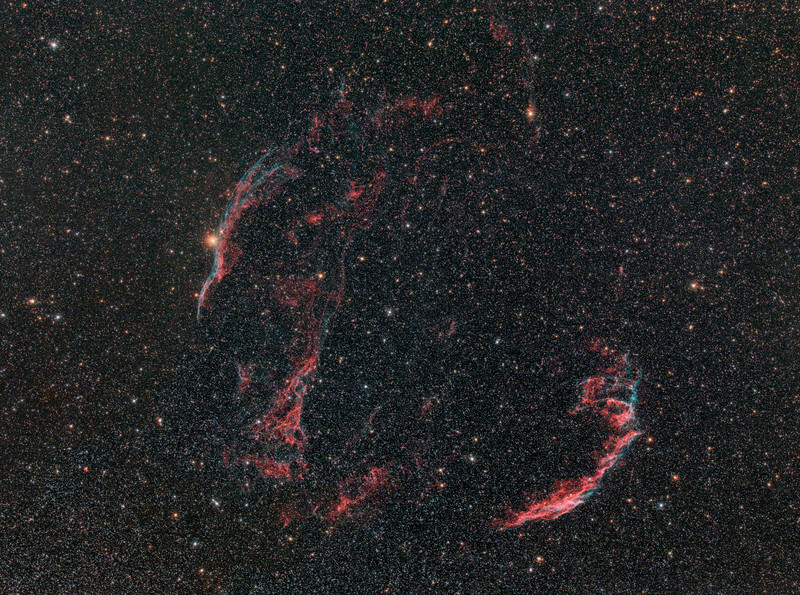 It constitutes the visible portions of the Cygnus Loop (radio source W78, or Sharpless 103), a large but relatively faint supernova remnant. The source supernova exploded some 5,000 to 8,000 years ago, and the remnants have since expanded to cover an area roughly 3 degrees in diameter (about 6 times the diameter, or 36 times the area, of the full moon).